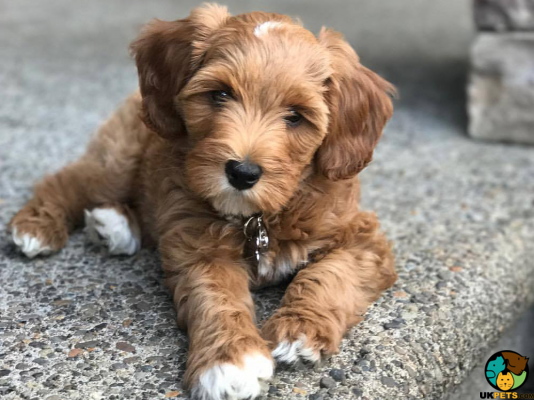 The Labradoodle is probably one of the most beloved crossbreeds in the world because of its gentle disposition, intelligence and cute appearance. It was developed in the late 80s in Australia with the objective of producing a hypoallergenic guide dog. 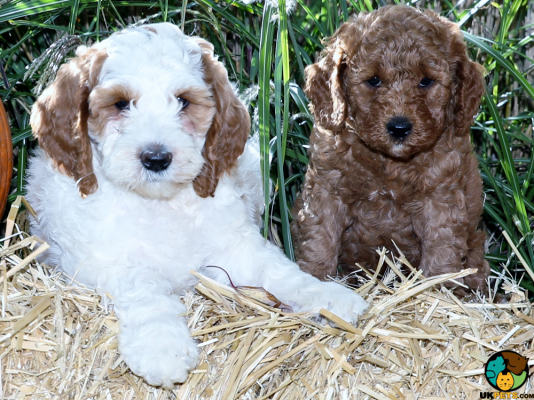 Like most hybrid dogs, Labradoodles come in varying sizes, colours and overall looks. 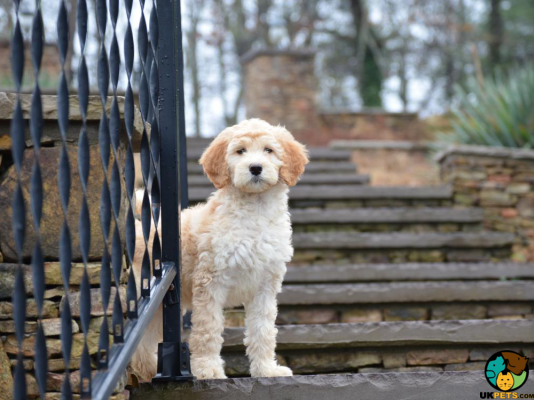 Are you opening your doors to a Labradoodle anytime soon? Before you decide to take the plunge, read about this intelligent and affectionate crossbreed. The Labradoodle is believed to have been first bred in Australia in 1988 in the hopes of creating a highly trainable and hypoallergenic guide dog. The first successful cross between a Labrador Retriever and a Standard Poodle was done by Wally Conron at the Royal Guide Dogs Associations of Australia in Victoria. It produced a dog named Sultan, which became a guide dog for a woman in Hawaii for a decade. Because of its trainability, gentle nature and cute appearance, it quickly became a sought-after breed both as a guide dog and family companion. It is also currently being used as a therapy and assistance dog. Labradoodles are usually produced by crossing a Labrador Retriever and a Poodle. However, multigenerational breeding has been done to hopefully produce a workable and recognisable breed. Since it is still considered a hybrid, the Labradoodle is not recognised by The Kennel Club. However, the Labradoodle Club in the UK (UKLA) serves as the regulatory organisation to maintain good breeding practices. 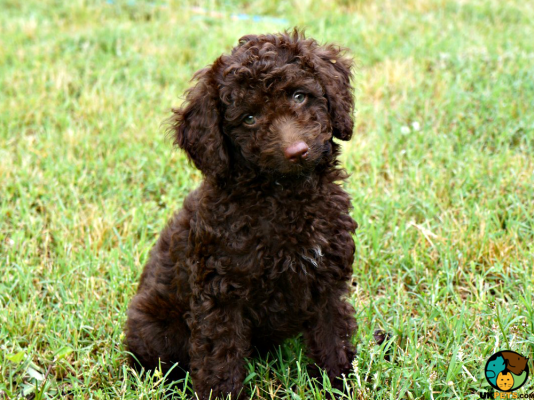 Like most hybrids with parents that differ in size and looks, predicting the overall appearance and adult size of the Labradoodle is quite difficult. In fact, puppies in one litter could look totally different also based on colours and coat quality. The fleece coat, which tends to be long and can be straight or wavy. This type is low shedding and often described as an Angora coat texture that is silky. The wool coat, which is made up of tight curls, taking after the Poodle. This type is virtually non-shedding and hypoallergenic. 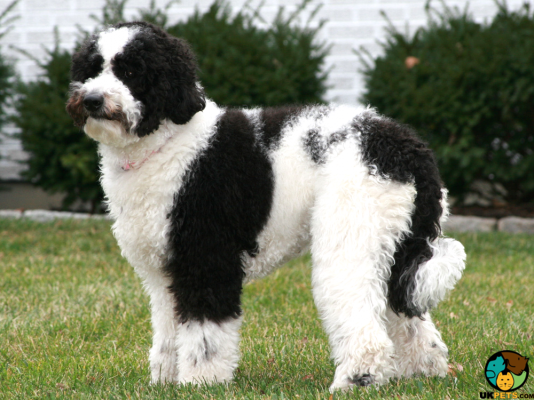 The hair coat, which is the least popular and often seen in first-generation Labradoodles. It takes after the Labrador Retriever so it sheds profusely all year round. Doodles usually come in black, red, blue, silver, caramel, chalk, chocolate, café, cream, lavender, parchment, apricot/gold, and apricot/cream. How much grooming your dog will require depends on the length and texture of the coat. Labradoodles usually only require brushing one or twice a week. Others will need to be professionally trimmed or clipped especially those with fleece coats. Bathing can be done as needed. The Doodle is highly trainable because of its intelligent and people-pleasing characteristics. However, as a high-energy dog, its trainings should include plenty of physically and mentally stimulating activities. It will enjoy walks with its owners but there must be more challenging and fun activities later in the afternoon. It will also enjoy going swimming because it loves the water. In order to be a well-rounded and obedient dog, its energy needs have to be met else it gets destructive or sometimes noisy. A typical serving for an adult Labradoodle is 1 to 2.5 cups of excellent quality dry dog food per day, depending on its age, size, build, activity level, and metabolism. Because Doodles significantly vary in size, ask your veterinarian how you should feed your dog. Purebred or not, all dogs deserve the best type of food. The most practical option is dry dog food with animal protein as the top ingredient. However, you can always prepare your pet’s food just make sure you pair it with supplements to avoid nutrient deficiencies. Always include Omega fatty acids to keep your Labradoodle’s coat healthy. Crossbreeds are often said to be healthier and tend to live longer than purebreds and Labradoodles are a great proof for this claim as they can live up to 15 years. However, like most dogs, they can be predisposed to certain health problems such as ear problems, eye issues like Progressive Retinal Atrophy and Cataracts, Hip and Dysplasia, Cruciate ligament injuries, Patellar Luxation, Addison's disease, and Sebaceous Adenitis. The Labradoodle is a smart, high-energy dog that requires at least 1 hour of daily exercise. This can be in the form of short walks in the morning, games of fetch in the afternoon, as well as free time at a fenced yard. If it is unable to let off steam and release its energy, it will look for other things to do, which can be in destructive means. Also ensure that your yard’s fencing is secured or it will try to escape to be busy elsewhere. 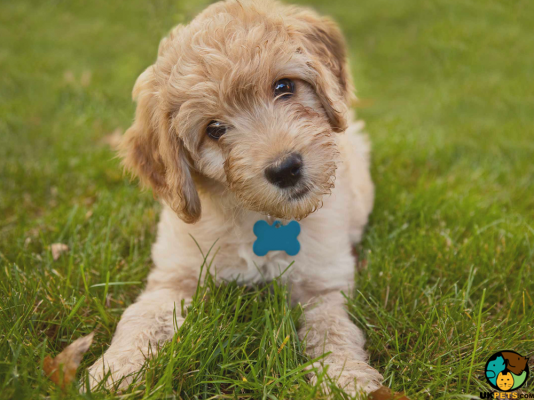 Although it is not a full-fledge pedigree breed, a well-bred Labradoodle puppy costs around £600 to over £900. The expenses in caring for a Labradoodle is much like that of any pedigree breed because any dog, regardless if purebred or crossed need to be treated with the same love. For instance, it also requires high quality dog food, which will cost £30 to £40 a month, depending on its adult size. Buying basic equipment (crate, bowls, toys, bed, collar/leash, etc.) will cost around £200. Another important yet expensive aspect of responsible dog ownership is veterinary care, which includes regular check-ups, initial vaccination and flea worming treatments, and booster shots. It could set you back up to £900 in a year especially when your pet requires neutering/spaying. This does not include treatments and/or hospitalisation when your dog gets sick, which is why pet insurance is important. Insuring your Labradoodle will cost you around £25 to £45 per month, depending on the coverage you select. As a rough estimate, prepare to shell out around £60 to £90 a month to raise a Labradoodle. 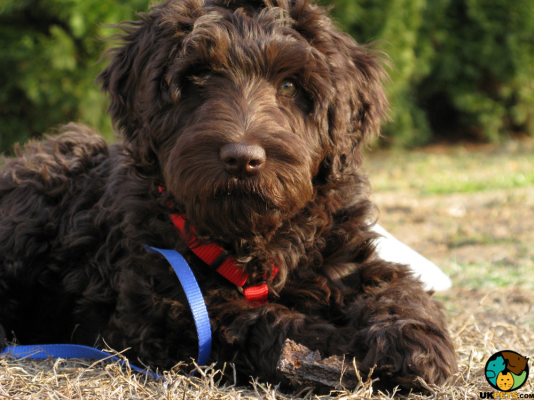 Is a Labradoodle Right for You? The Labradoodle is an intelligent, gentle and people-pleasing dog. Since there are no breed standards, it comes in varying sizes, colours and overall physical characteristics. It is not registered with The Kennel Club. Grooming depends on coat length and texture. It needs a minimum 1 hour’s worth of exercise per day.